Sausalito is a prime location" just north of the Golden Gate bridge, it offers tremendous views of San Francisco and its beautiful bay. 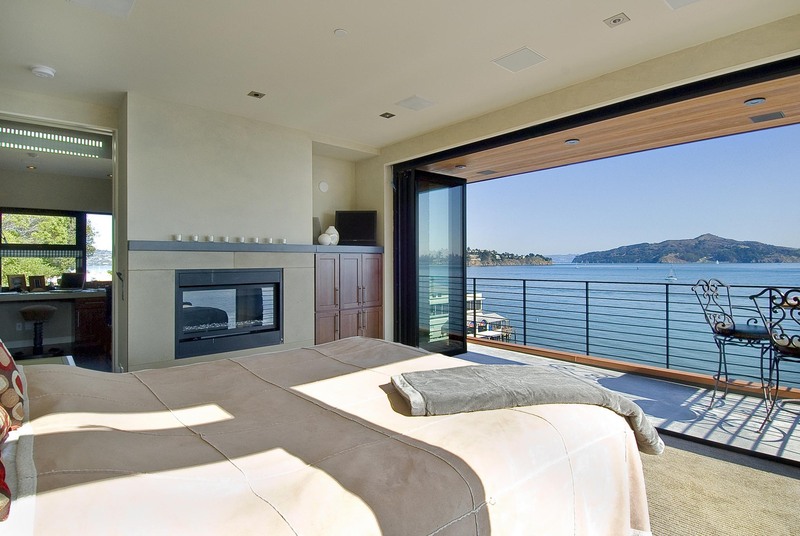 To build a new condominium on Bridgeway Avenue – the main road of this upscale suburb – and to have it perched 30 feet above the local inlet, Richardson Bay, was the challenge presented to the local firm, Michael Rex Architects. Because of the small footprint of the unit, the designers needed to maximize space. Utilizing NanaWall opening glass walls in the master suite and dining room helped increase the size of the 2,100-square-foot condominium by opening it up and bonding it with the spectacular location. 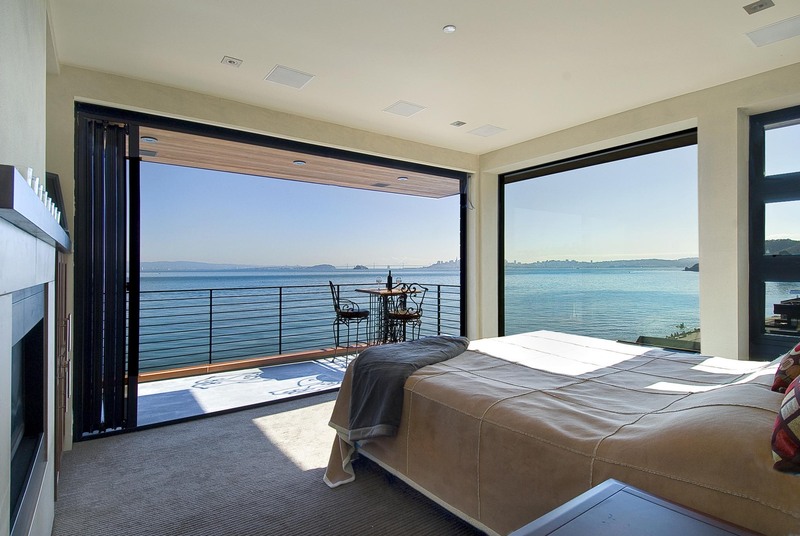 Originally, Stankus and his firm were considering using sliding glass doors in the bedroom, bathroom and dining room, but NanaWall allowed for a greater opening. 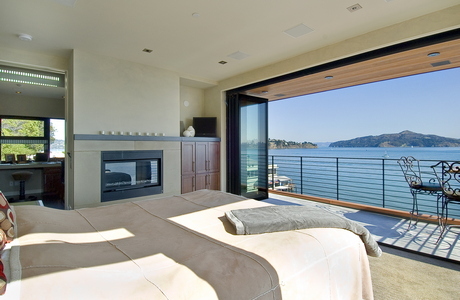 In the master bedroom and dining room this was an excellent design decision, as the homeowners now may relax on their terrace or patio, gazing at Belvedere, Angel Island and the city skyline beyond. Indoor and outdoor space has become one. The firm used NanaWall because they were familiar with the product and had already used it on a few jobs. Moreover, the NanaWall SL60 system, finished in black anodized aluminum, matched the other glazing on the house and the black finishes throughout the dwelling. The top floor — with bedroom, office, coffee bar and bathroom — is a stunning master suite. 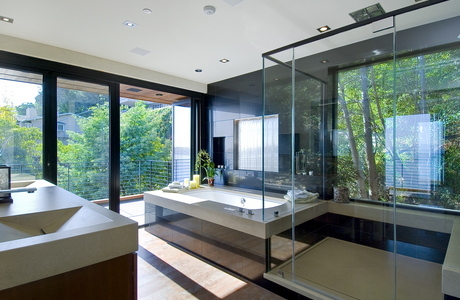 The bathroom, like the bedroom, is expanded with a cantilevered terrace. The SL60 system contains a fixed window, swing door and three folding panels. The black anodized finish complements the black tile work above the tub, too. Large trees and hidden blinds provide privacy for the intimate space. The first floor includes an open-spaced living room, dining area, and kitchen. The living room is dramatic, as the small space expands up to the third floor. Because the guest suites are above the dining area, this space feels much smaller as compared to the living room. Yet by joining the expansive patio with the dining area, thanks to NanaWall they solved this drawback. 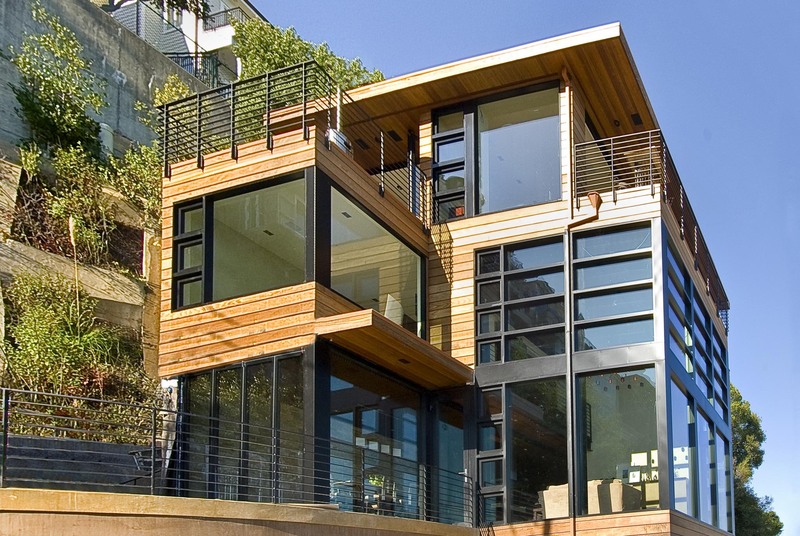 The SL60 system completely folds away, bringing natural ventilation and the sounds of Sausalito into the house. However, the NanaWalls have excellent sound attenuation, so the homeowners can isolate themselves when they close the walls. The indoor/outdoor space shares masonry aesthetics. Courses of stacked stone stretch along the curvilinear patio walls and built-in barbeque. Along the entire length of the dining and kitchen area, Michael Rex Architects utilized the stacked stone as wall tile and kitchen backsplash. Indoor and outdoor space has truly been blurred – adding enjoyable openness and drama.